Although I could write a narrative on each of the following landscape features, how they funnel deer, and how to hunt them, the most important thing to know is how to identify them on a map. With hunting season quickly approaching, scouting is likely on your agenda, and if you’re hunting the hill country, then here are some good terrain features for stand locations. Keep in mind that these areas are not always loaded with deer sign. They are travel corridors, and deer usually do not spend a significant amount of time in these areas rather they just passing through them to get from point A to point B. 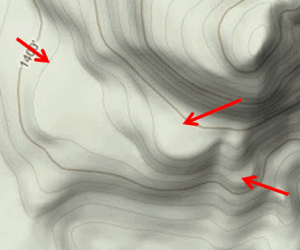 A saddle is a low spot between two hill tops and they are most easily identified using topo maps, or 3-D images. They are very easy to identify, and they serve as excellent deer funneling features. Figure 1. Two saddles with predicted deer trails depicted (red lines). Notice how the trails tend to converge at the saddles. Figure 2. Ground level 3-D view of a saddle. 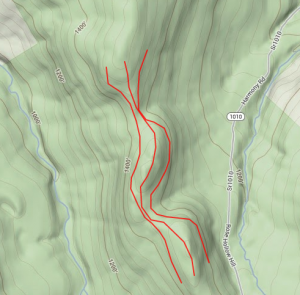 Benches are relatively flat areas along hillsides and they are most easily identified using topo maps. They can be subtle or blatantly obvious. 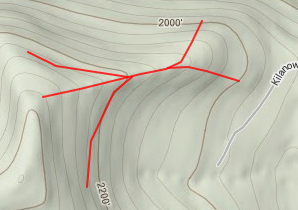 Basically, what you are looking for on a topo map is an area on a hill side where the topographic lines are farther apart from each other than the surrounding topo lines. Figure 3. Benches can be big or small, but regardless of the size they funnel deer. 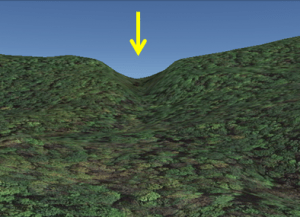 Points are isolated ridges that gradually slope down to lower elevations. They are easily identified on topo maps, and 3-D images. Deer will often funnel along points to access the bottoms or hill-tops. Figure 4. Points also vary in size, and even very small points can funnel deer from hilltops to bottoms and vice versa.